How did you get your first break internationally then? At the first World Round I was 16, nobody knew anything about me or who I was. At the very first race of course back then the starting time was really crucial and we had only the big group of 90 riders I think or 85 riders and the top riders and so there was big difference if you had to start as the first rider or the last rider of the pack. I happened to pick the last time before the top 15 guys at my very first race. So the very first World Round I was there with all the top guys. You know I was there with Michaud, Lejeune and all the world round guys. I could ride pretty decent ,so of course all of the factory guys would see me in the sections and they didn’t know who I was, they just saw this little kid who was riding pretty good so all of the factories were actually knocking on my door after the first couple World Rounds. After the first World Round we got a lot of offers. They started talking to me and you know offering me stuff, direct from the factories. 16, that was in Spain. Had you travelled down there with a number of pals to go riding? Yeah, like I said, my parents took me there when I was 14 or 15 to practise in the winter time, but also to get used to being abroad and away from home and seeing foreigners and they eat the same bread and they breathe the same air and there’s nothing special about it. A lot of people when they go abroad everything is new and different and they use a lot of energy just to travel and just being abroad and for us, my parents taught me travelling is just something you need to do to get somewhere to do what you need to do. We have to get used to it, the environment, being abroad and then use all of the energy when we ride at the locations. So we went there when I was 14 and when I was 16 that was my first trip by myself with my neighbour kid as well actually. We packed our little van and off we go, two month in Spain and of course back then we didn’t have GPS or cell phones and we were kind of remote and isolated from everything there. I think I was 21st at that first event in Spain if I remember. What bike were you riding in that trial? A little Fantic. My family, we were not a poor family but we are not from the wealthy family by any means so my parents had to use all of their resources to get me there. We were kind of struggling, well they were struggling. They put all their money and effort into getting me there. Luckily the local Fantic importer helped me a lot to. He helped me with the bike. I had two engines for it. I had only one bike but two engines because I had to ride 125cc in Finland and 250, I think it was 250 at the World Rounds. So I would come back here for the Finnish Championships, we would just swap engines on the bike and this would work out good. Luckily, the factories had interest in me and I got a factory contract pretty quick. It worked out really good. 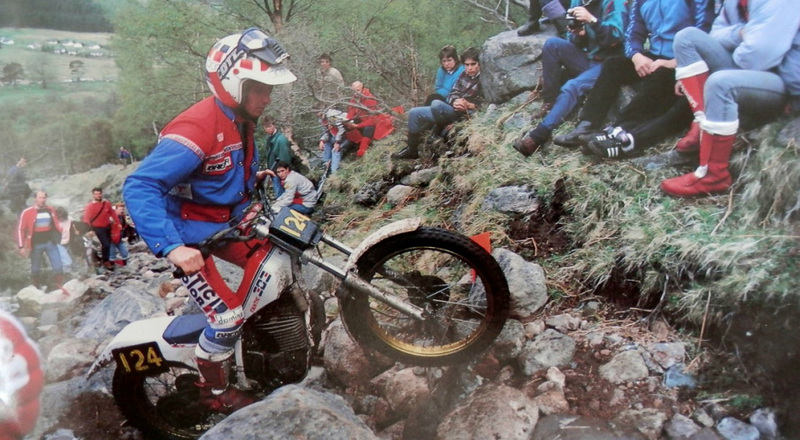 One of the first World Trials that you rode was at the UK in 1988. Do you remember this? Yes. I think this was my 2nd World Round probably. It was muddy event. I remember it. There was only a couple of sections that used 3rd gear, it was mainly 3rd and 4th, mainly 4th all of the time. There was pretty bad mud all over. Do you get much mud up here in Finland? No no, not at all. That was actually the first time that I ever had ridden in muddy conditions, we rode sandy hills, we had a little sand pit where we practised a little bit when we were kids. That was somewhat similar but nothing with mud I’ve ever rode in. We was be practising back then all of the time, we would be building little trials circuits in my back yard so that when I got home ,I could ride in my back yard for a couple of hours and when my parents got back from work, then we would go and ride somewhere else. Luckily back then there were plenty of riding areas, some of them being legal and some of them being a little less legal. We had 4 areas of riding within 15 minutes of our home so we could ride in different areas each day of the week and also depending on what type of conditions we had coming up we could go and practise it. We were really fortunate about riding areas. Was there anyone in the world circuit who helped you out? Actually yes, we got friends with Steve Saunders and with his mechanic Derek Edmondson. He helped me out when they could with a few special parts that they had left over or they had broken, so we could fix it. Yes Derek Edmondson …..I really appreciate their help. It wasn’t that significant but it was a big deal for us because at least we had some special parts and it also helped us out mentally and gave us support. It was a really good help. 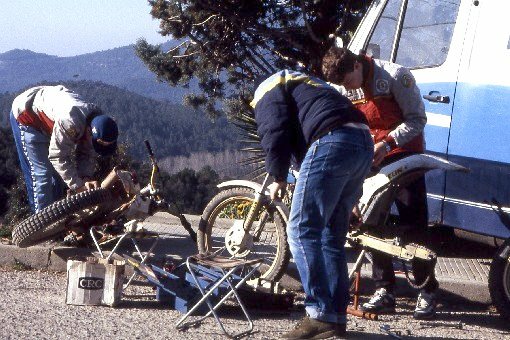 And of course when we were in Spain, Andreu Codina helped us as well. We stay at Sant Feliu De Codinas and if we had any problems he would help us out as well. This was back in 1988. You rode the Fantic in 88 apart from the last 3 World Rounds when you rode an Aprilia. What happened there? Why the change? Well, I remember after the 4th World Round in Belgium I have an offer from Aprilia, Fantic, Montesa and also Honda Europe. The CEO from Honda Europe came to that event and they were planning on starting a big Honda team again and they wanted me to be a Honda rider and of course Honda having the biggest name in the industry we were really excited that this was the direction that we wanted to go. It would have been awesome as they wanted to build a team around me and all that stuff. Well that never happen, it was just talks with him. Nothing seemed to happen and then we had concrete offers from Montesa, Aprilia and Fantic. We went to the Italian round and Fantic set up a meeting with us either Wednesday or Thursday before the race. We were supposed to go to the Fantic factory. Aprilia heard about it and then, they insisted that I come to the Aprilia factory on Tueday, the day before I was due to go to Fantic. Basically we went there. It was kind of an amusing situation. We had never been in negotiations. We didn’t know how much riders earn or how much money to make, then off course back then Italian liras had a lot of zeros on it so ha the exchange rate was pretty hard to figure out how much they were really going to pay me I did not know if I’m getting screwed over here, so it was a really tricky situation. We tried to talk to some of the riders but they would not tell how much they make so then we went there. Basically they wouldn’t let us out of the room until we signed the contract and they said that they have this new water cooled bike coming out and try and convince me in every way. They wouldn’t show me the bike until I signed the contract but they would talk about it. We walked around the factory and its sounded pretty good what the factory could do and made it sound impressive so at the end we signed a contract with them. 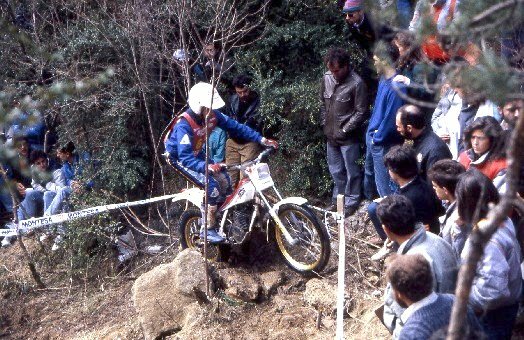 It was probably a two year contract I remember back then Ettore Baldini who was the head mechanic there at the time he said “you’re going to be World Champion in 92”. I thought that’s only 4 years away, I think it’s going to take a little longer than that. I guess he was he knew what he was talking about haha . 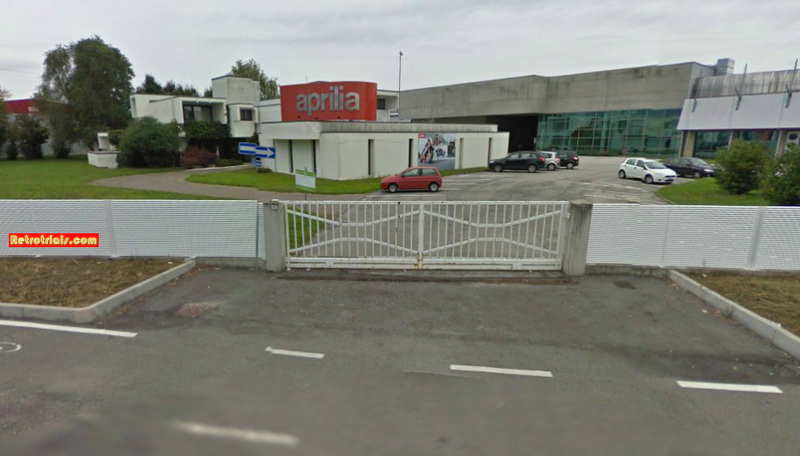 What was the Aprilia factory like? It was pretty cool. During my career I could see the transformation of the Aprilia factory. Back then in late 1988 it was just a couple of warehouses. It was a pretty good size but it was still a couple of warehouses building bikes on the benches and the really laid back atmosphere. The gates were open and when we left the bureaucracy was crazy. To get one sticker out of the gate you had to fill out a couple of forms, people got fired from the production line if they forgot a couple of bolts in their pocket when they went to eat across the street. So it turned from this laid back small factory to this big industrial complex that was really strict and everything got really slow cos you had to get approval after approval and signatures for everything, just to get a couple of stickers. It was kind of cool to see the transformation but then when I started it was really cool. They had enduro, trial and road race department right next to each other so we could see inside of each department. I spent a lot of time there all of the time so we went to eat together and did a lot of stuff, so it was good fun.